One topic linking all three developments together concerns the establishment of international standards to protect clinical trial data that have been submitted to regulatory authorities for the marketing approval of pharmaceutical products. During the negotiations for the Trans-Pacific Partnership (TPP), for example, the protection of clinical trial data submitted for the marketing approval of biologics was highly contentious. Although the United States’ withdrawal in January 2017 has since placed the TPP Agreement and its data exclusivity provisions for pharmaceuticals and biologics on life support, the debate on the protection of clinical trial data will continue and will emerge in future bilateral, regional, and plurilateral trade negotiations, including the renegotiations on the North American Free Trade Agreement (NAFTA). 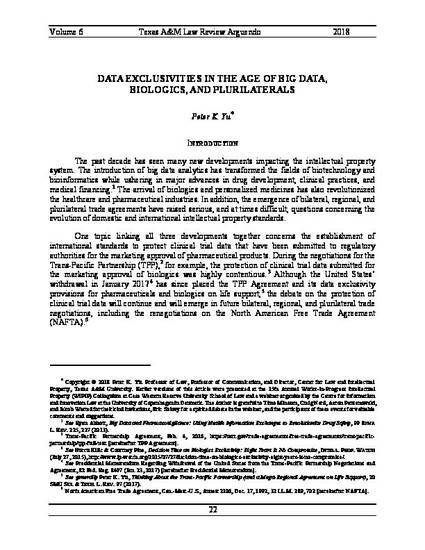 Part I of this Article reviews the protection of clinical trial data under Article 39.3 of the Agreement on Trade-Related Aspects of Intellectual Property Rights (TRIPS Agreement) of the World Trade Organization (WTO). Even though the provision covers both pharmaceutical and agricultural chemical products, this Article focuses only on the former. Part II examines the additional protection clinical trial data have received through TRIPS-plus bilateral, regional, and plurilateral trade agreements. Part III outlines five specific recommendations to help advance the debate on such protection in the age of big data, biologics, and plurilateral trade agreements.